VW's complex internal politics makes life difficult for high-profile newcomers such as Diess, pictured. FRANKFURT (Bloomberg) -- Volkswagen Group's efforts to placate unsettled workers risk undermining VW brand chief Herbert Diess. In an agreement announced Monday meant to quell a conflict with labor leader Bernd Osterloh, VW Group said CEO Matthias Mueller will oversee talks on safeguarding the VW brand's jobs and factories. 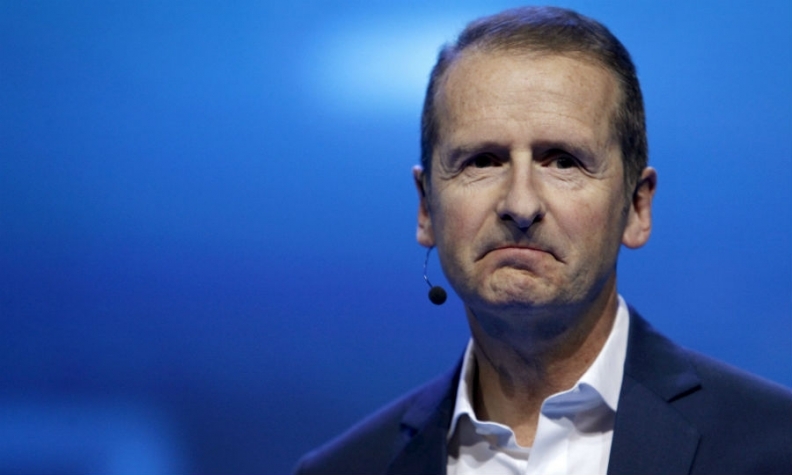 Diess, a former BMW executive and one of Volkswagen's most high-profile hires in years, will help draft the brand's strategy objectives, which could end up being sidelined by the union negotiations. Diess was recruited by VW last year to overhaul the carmaker's namesake brand but he has clashed with the automaker's powerful labor leader Osterloh who last week said he lost trust in Diess's leadership. "From the outside, it would appear that Diess is increasingly ostracized," said Arndt Ellinghorst, a London-based analyst at Evercore ISI. "VW's supervisory board needs to express stronger support for Mr. Diess in order to avoid him becoming a 'lame duck'." Diess, who joined Volkswagen in July, embarked on a 12-point initiative last year to revive profitability at its largest unit, which has become a critical part of the carmaker's efforts to weather the emissions-cheating scandal. His push to make the VW brand more independent is also a test of Volkswagen's ability to break with a past in which decision-making was highly centralized. Volkswagen sought to defuse the impression that Diess has been weakened by CEO Mueller's role in the talks. The VW brand chief "expressly welcomes" the agreement to start negotiations with workers as it will help "strengthen the brand," a spokesman for the unit said. Key Volkswagen power players declined to expand on comments made in a Volkswagen statement on Monday. While Diess has won praise for seeking to slim down the VW brand's bloated administration and reducing complexity in the unit's portfolio, he's been criticized for failing to promptly inform labor leaders and other power players of key plans and initiatives, according to people familiar with Volkswagen's inner workings. The company's complex internal politics has made life difficult for high-profile newcomers such as former CEO Bernd Pischetsrieder and Wolfgang Bernhard, past head of the VW brand. Both were pushed out a decade ago after running afoul of labor leaders. Workers, which control half the seats on Volkswagen's supervisory board and have special rights that enable them to veto plant closures, have unusually strong sway at Volkswagen, in part because of their political influence in Lower Saxony. The German state has two seats on the supervisory board and often sides with the carmaker's workforce. Osterloh last week stepped up attacks on Diess, saying management of the VW brand "lacks reliability" and citing a "grave problem of trust." He charged Diess with trying to use the scandal to push through deep cutbacks. But the unit was struggling even before the crisis. A cumbersome structure increased costs and made VW slow to roll out sought-after SUVs. The brand's margins were 2.8 percent in the first nine months of 2015, compared to the 5 percent return on sales that former laggard PSA Group generated last year. In the statement Monday, Wolfgang Porsche, head of the family that controls the majority of Volkswagen's voting shares, said he knows and respects Osterloh and Mueller, who are both "responsible gentlemen," and trusts them to get the job done. He didn't mention Diess. A spokesman for Porsche referred to VW's statement and said the joint management-labor effort includes Diess as brand chief as well. Stephan Weil, who represents the German state of Lower Saxony on Volkswagen's supervisory board, declined to comment on Diess's role. He also didn't mention the executive in Monday's statement. Diess last year announced plans to cut spending by about 1 billion euros ($1.4 billion) a year and accelerate restructuring started under former CEO Martin Winterkorn. Labor unions initially backed the effort, compiling a 400-page folder on how to trim costs without cutting staff. But Diess's push for a 10 percent efficiency improvement stoked fears that his strategy will lead to large-scale job reductions, creating a rift with Osterloh. "The risk that Diess leaves has increased" after Monday's statement, said Sascha Gommel, a Frankfurt-based analyst at Commerzbank. "It wouldn't be a good development."